I’ve been thinking a lot about left and right-wing politics, due to the extremely polarized nature of the current American/Western political landscape. Naturally, I started thinking about left and right-wing ideologies in the cryptocurrency space, and how increasingly relevant these ideologies have become in this space. In the early days of Bitcoin, arguments revolved purely around the technology and efficient solutions to tractable engineering problems. If there was any ideological arguments, they were mostly between Hodlers (people that believe in, or can at least see some value in cryptocurrencies) and Nocoiners (people who think that Bitcoin is stupid). But these days, major conflicts in the crypto space can be described as intractable ideological conflicts. The block size debate is an example of this. The numerous skirmishes between altcoins vs Bitcoin, or altcoins vs altcoins is another example. In this article, I will describe how we can look at these ideological conflicts the same way we look at mainstream political conflicts. More specifically, I will describe how the concept of left-right political spectrum applies to people in the cryptocurrency space, which I will call “hodlers” for a lack of a better term. Psychologists have done many studies to discover differences in the way conservatives and liberals think. One important finding from these studies is that the amount of fear, or the lack of it, is a critical component of whether a person is left or right-leaning. The presence of fear shifts people to the right side, while the lack of it shifts people to the left side. Studies have shown that conservatives (right-leaning people) are more responsive to physical threats and other negative stimuli, focus more on threatening imagery rather than pleasant imagery , and have a larger amygdala (a region of your brain that processes fear stimuli) than liberals. Academics have coined the phrase “negativity bias” as a way to describe the tendency of right-leaning people to be more fearful and more responsive to negative stimuli. Conversely, you could use the phrase “positivity bias” to describe the tendency of left-leaning people to be less fearful. The opposite of fear is hope so you could say that liberals are more hopeful, and conservatives are more fearful. Here are some further summary readings on the issue: 1 , 2. The hypothesis that fear and hope are the driving emotions that separates people into the right and left seems to be very fitting if we look at ideological battles in the cryptocurrency space. Below, I present my definition of right-wing hodlers and left-wing hodlers. The right-wing hodlers are driven by a fear of the worst case scenarios. Worst case scenarios in the crypto space will generally involve adversarial attacks against the blockchain by a nation state. It could also be related to personal loss/theft or unforeseen errors in the code that results in catastrophic consensus failure. Because their main instinct is fear of the worst case, the right-wing hodler’s focus is on security above everything else. For a right-winger, means to achieve security is derived from their strict adherence to cryptographic rules and stable Nash equilibrium solutions. In some sense, you could characterize them as Technocrats, an overly logical bureaucrat that is beholden to technology, instead of the government. A good fictional archetype might be the Vulcan race in Star Trek. Someone like Gregory Maxwell and Peter Todd would be a good example of a right-wing hodler. The left-wing hodlers are driven by their hope for the best case scenario. The best case scenarios generally involve the destruction of fiat or a large scale adoption of cryptocurrencies in the global market. The scenario also includes personal increase in wealth, narratives regarding egalitarianism (i.e, “banking the unbanked”), and the take down of tyrannical governments. Because their main instinct is hope of the best case scenarios, their focus is on innovation. Innovation for a left-winger involves creating new ways to utilize the blockchain, or inventing some alternative decentralized consensus methods (such as proof of stake). This is not to say that a left-winger does not care about security at all, it just means that they are more willing to make a security trade-off in order to achieve their goals. The left-winger could be characterized as techno-evangelists and culturally they have a lot in common with Silicon Valley start-up entrepreneurs in the mold of Steve Jobs and Mark Zuckerberg. Vitalik Buterin and Roger Ver are good examples of left-wing hodlers. 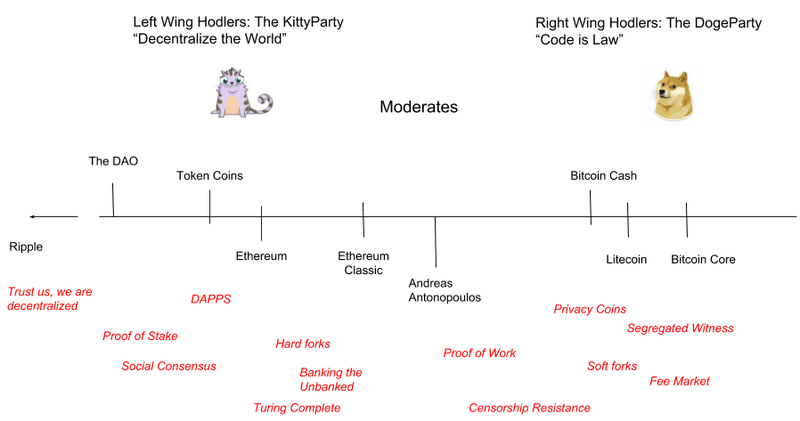 Here is a rough graph I made that places different cryptocurrencies and ideas in the crypto space on a left-right continuum. For fun, I’ve named the left-wing after the latest Ethereum collectible craze CryptoKitties, and the right-wing after the POW stalwart meme-coin Dogecoin. The center is anchored by everyone’s favorite shining beacon of blockchain information, Andreas Antonopolous. Note that the words in red are ideas that have nebulous associations with their placement, thus their location are inexact (for example “freedom of speech” is historically a left-leaning concept in mainstream politics, but can also be adopted by the right). The right-wing is anchored by Bitcoin, the original blockchain created by Satoshi Nakamoto. The central tenet since the inception of Bitcoin has been proof of work (POW), and to me it seems like it is still a centrist position despite the fact that I’ve drawn up Bitcoin to be on the far right. Rogue ideas like proof of stake may have pushed POW to the right-hand side by a bit, but since most cryptocurrencies are POW based, I think it’s in an appropriate position. It’s important to note that when Bitcoin was first created, the concept of left and right-wing was limited in scope to conversation between sophisticated Bitcoin devs who understood that many problems in the blockchain could not be solved without making concessions on security or decentralization. This concept did not exist in the consciousness of the general public. In those days, the general Bitcoin public behaved very much like a classic left-wing archetype. Optimistic slogans like “global digital currency”, “fast peer-to-peer transactions”, “banking the unbanked”, and “low processing fees” are the creation of the left and can be credited with driving Bitcoin’s meteoric rise in the early days (the left-wing is much better at shilling than the right-wing). The rise of altcoins began the split of the Bitcoin community into separate factions. Litecoin was the first significant altcoin to emerge, and when it first came out it was seen as a radical idea. These days many people mostly dismiss it as a Bitcoin clone (which it literally is in the parlance of git). Ripple then came onto the scene and staked out a very far left position in the continuum, completely abandoning proof of work and laying a dubious claim that a cryptographic distributed consensus system was sufficient for a cryptocurrency. Currently, the left is anchored by Ethereum whose main difference from Bitcoin is its comparatively functionally rich and Turing-complete scripting language. Although Ethereum has many fundamental similarities with Bitcoin, the biggest one being proof of work, its leftist tendency is made clear by the grandiose plans of its developers and the actions it has taken to resolve difficult situations such as the DAO hack. Their proposed move to proof of stake will certainly move Ethereum even further to the left. If this happens, I suspect that some other cryptocurrency will fill the large gap in the left/right spectrum that it will leave behind. In summary, the political spectrum in the cryptocurrency space is occupied by the left, who is driven by hope, and the right, who is driven by fear. The left-wing wants to focus on innovation and the right-wing wants to focus on security. Important homework questions you might want to think about are: A) Where would you place yourself in the crypto-political spectrum? B) What political spectrum does a certain cryptocurrency belong to? C) What is the future crypto left/right landscape going to look like? In a future part 2 of this article, I will expand further on what it exactly means to be a left/right-winger in the cryptocurrency space and go over some examples from the past where this has played out with huge consequences. Further, we can establish some basic theories about how left/right-wing politics will play out in the future that will help us navigate all you hodlers out there to the moon.